Spring is here, whether I’m ready or not. I’m ready-ish. I have so many things I want to get done but they all require me to have already set up a giant compost delivery. With the rocky clay soil in my back yard, there’s really no point in doing anything outside until I’ve worked in some organic material. I compost myself, but I think I need a good 8-10 cubic yards of compost, not the little bit at the bottom of my compost bin. The nursery nearby has decent prices on the compost itself, but their lone delivery driver quit on them. Y’all may not know this about me, but I don’t own a dump truck. Sorry to let you down. 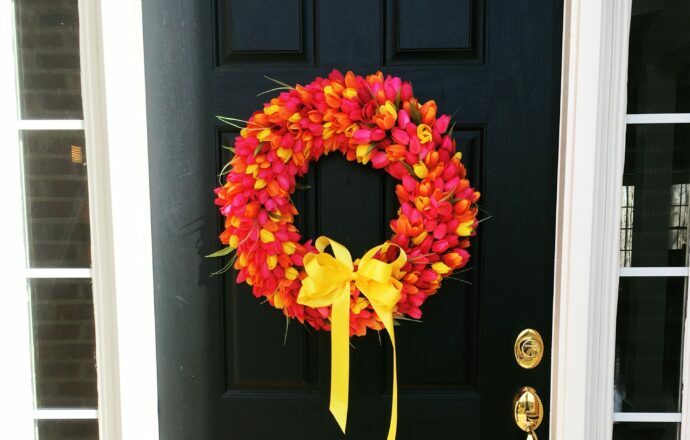 Anyway, while I wait for this eventual compost delivery I figured I could dress the front door for spring. 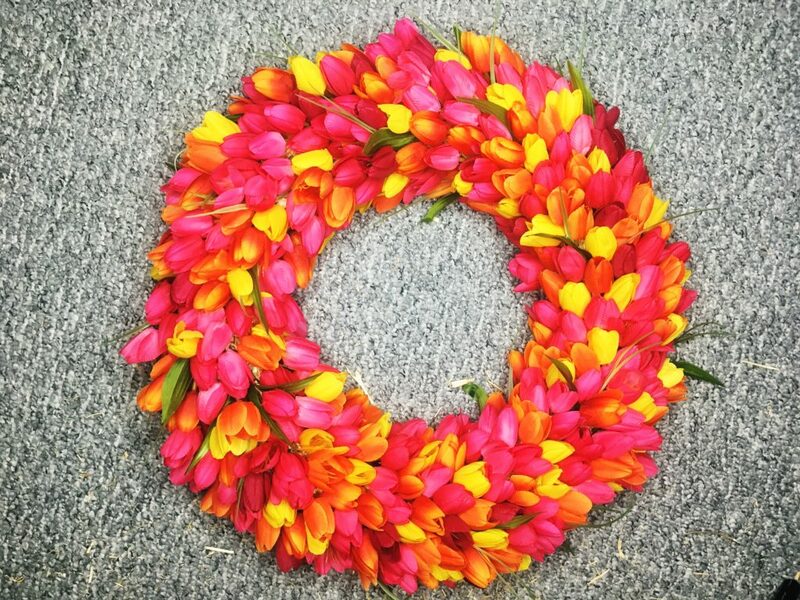 These tulip wreaths are all over Etsy and Pinterest right now, so I decided to give it a try. The tutorials I saw online didn’t seem sturdy though. Most of them had you wrap a wreath form with ribbon and then tuck the flower stems into the ribbon. I get strong wind where I live now, so I needed this wreath to be able to stand up to our crazy wind storms. I didn’t end up wrapping the wreath form with ribbon before starting either. 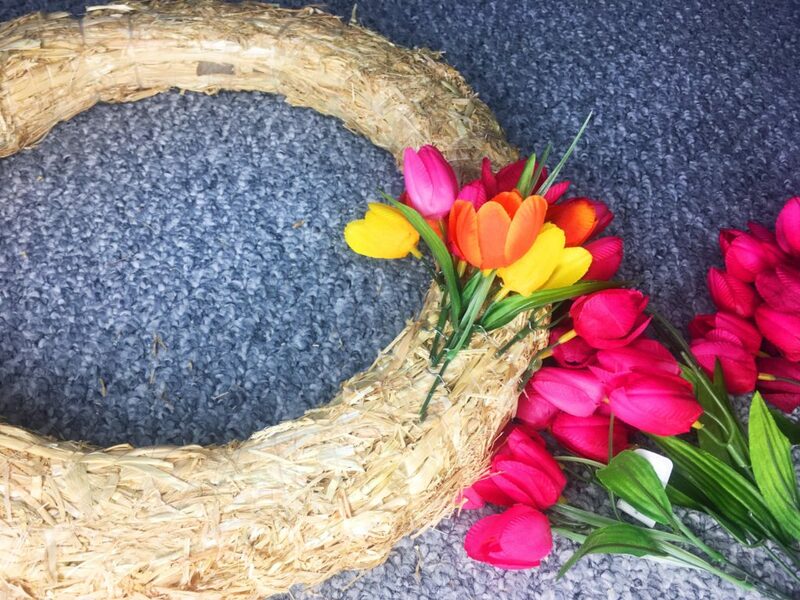 I figured the straw wreath would have a fresh, spring-like vibe if it ended up showing through. 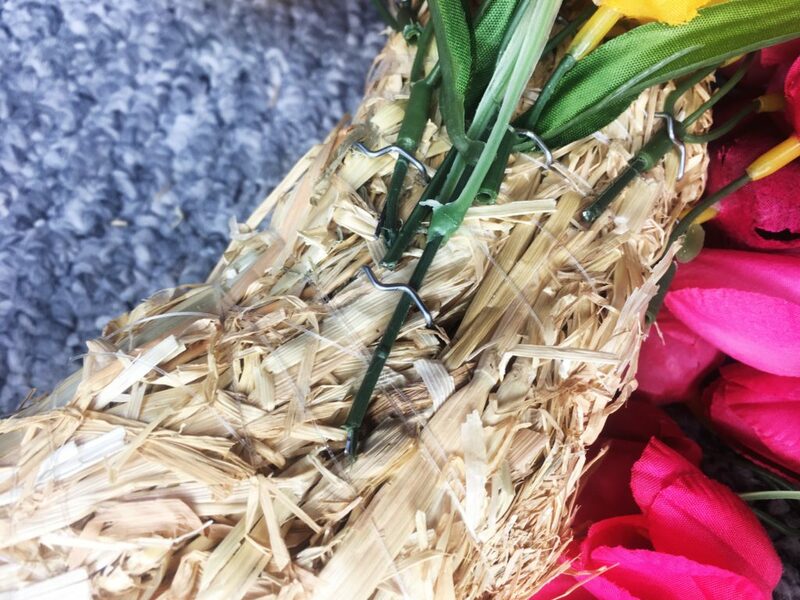 Plus, pushing the floral pins through ribbon is more difficult than just sticking them directly into the wreath. Readers of this blog know how bad I am about remembering to take pictures while I’m working on a project. So you’ll understand that I don’t have pictures of how I cut up the tulip bushes. Very important aside: tulips don’t grow on bushes so it is killing me to type “tulip bush” so often. But the “tulip bushes” were way cheaper than buying the tulips individually, so here we are. So basically, you’re just going to cut up the tulip bushes so that you have individual tulips to work with. 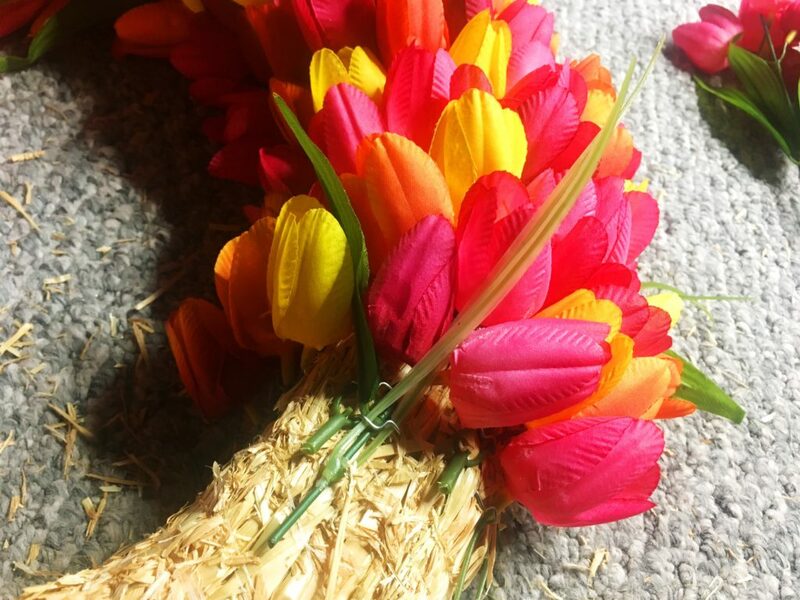 And then attach the tulips to the wreath using your floral pins. Hopefully y’all know how floral pins work. You just poke them into the wreath form. 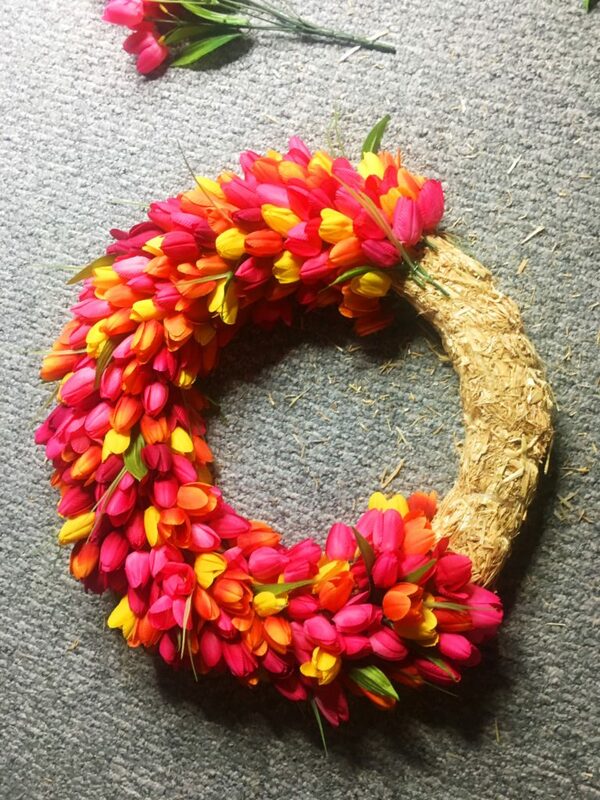 Y’all may have noticed that I have a tendency to make solid-color wreaths. My general aesthetic is lots and lots of color, but I rarely blend colors in one object. When I went to Michael’s to buy the tulips, I really thought I was going to just buy hot pink. But when I got there, I started combining the hot pink bushes with the orange/yellow bushes and I really liked it. So please play around with color when you’re at the store. You may surprise yourself! You’re just going to keep going around the wreath, making sure to mix up your colors in as random an order as you can. One of the benefits of the tulip bushes is that they come with faux leaves as well as the faux tulips, so make sure you pepper some of those in as well. This was one of the more tedious wreaths I’ve made, so make sure you have something to keep you entertained through the process. I watched a couple episodes of The New Adventures of Old Christine, so I was definitely okay killing an evening. 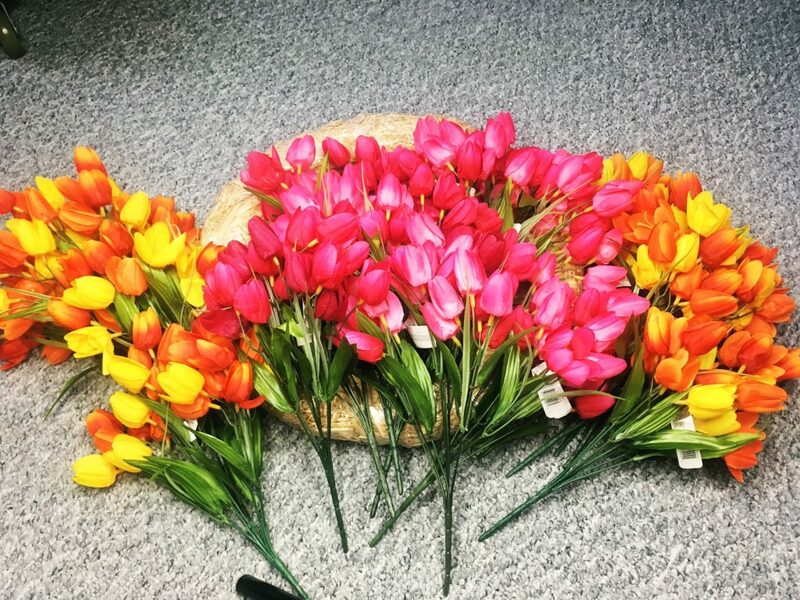 In total, I used 14 of these tulip bushes – 7 pink and 7 orange/yellow. And I have tons of the leaves left over for future projects! 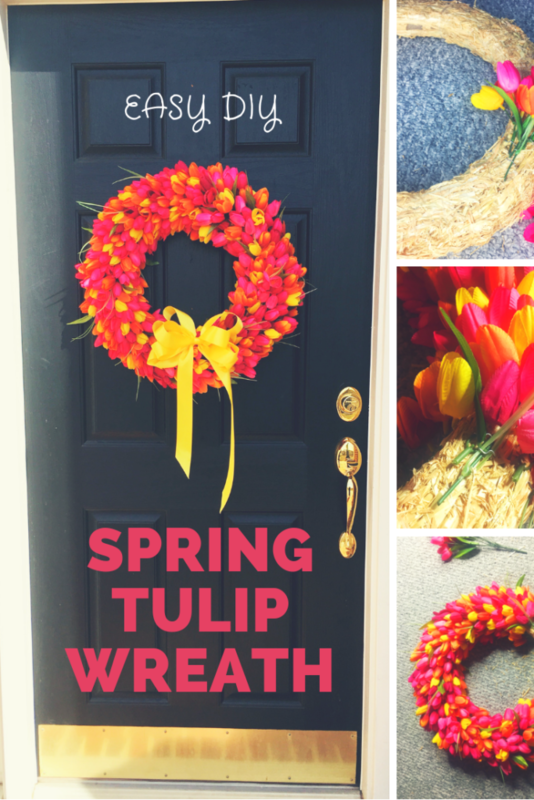 1 Comment on Welcome spring with this DIY tulip wreath!